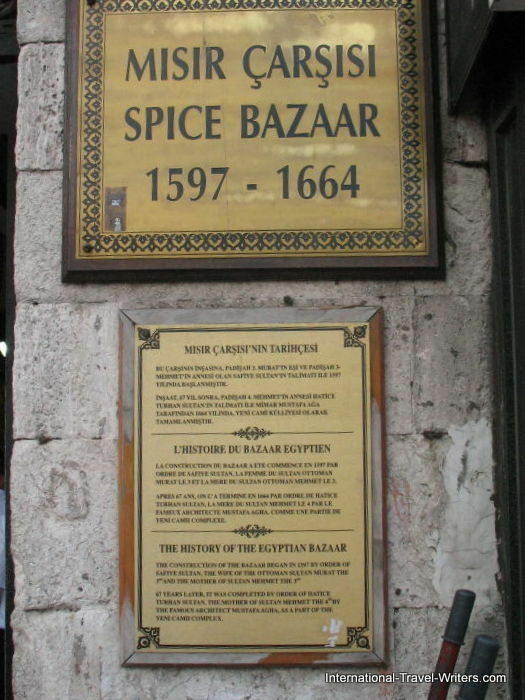 The Istanbul Spice Bazaar got it's official name "Egyptian Bazaar" because it was built with the revenues from Egypt. 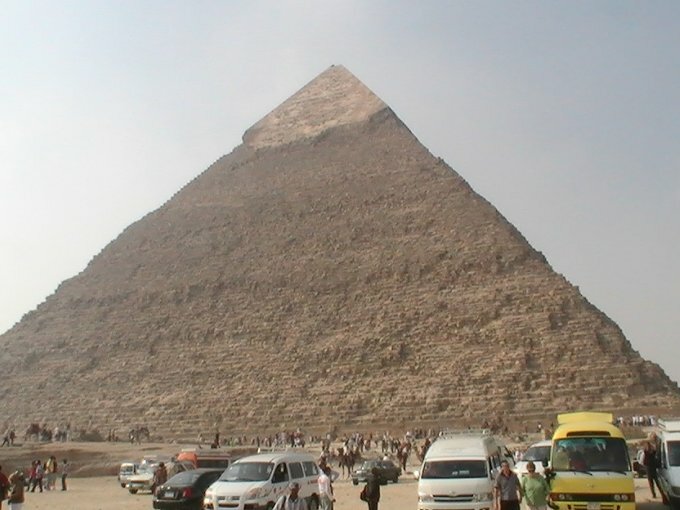 When it opened in 1664, it had been 7 years in the making. 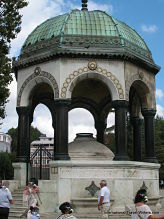 The main entrance faces the Yeni Mosque and it's in the neighborhood of Eminonu. 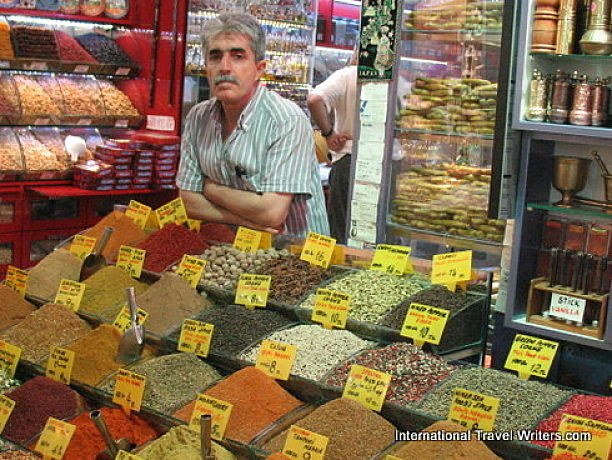 Spices we saw in numerous shops were cinnamon, coriander, cumin, curry powder, mint, paprika, saffron originating from Iran, Spain, Turkey (and other countries), sumac, and all types of peppers...black, red, white, whole or ground. I'm sure there were others I've not mentioned. 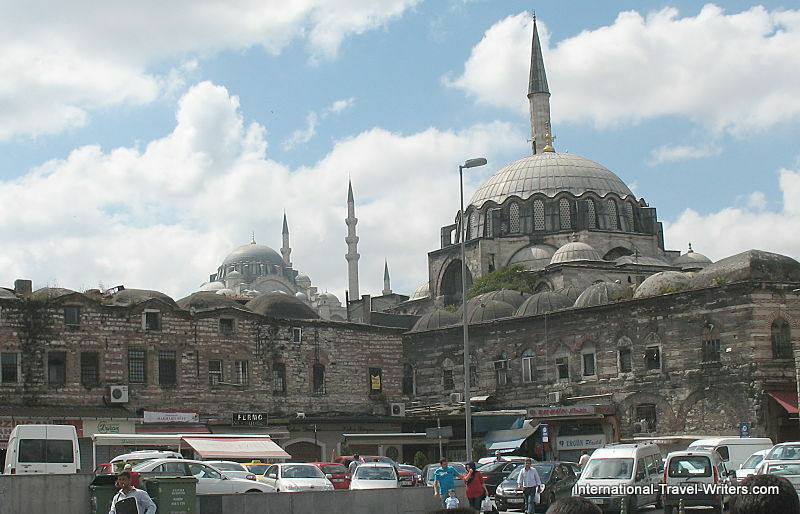 Rents from the shops help support the upkeep of the mosque...and most mosques have charitable affiliations to fund. 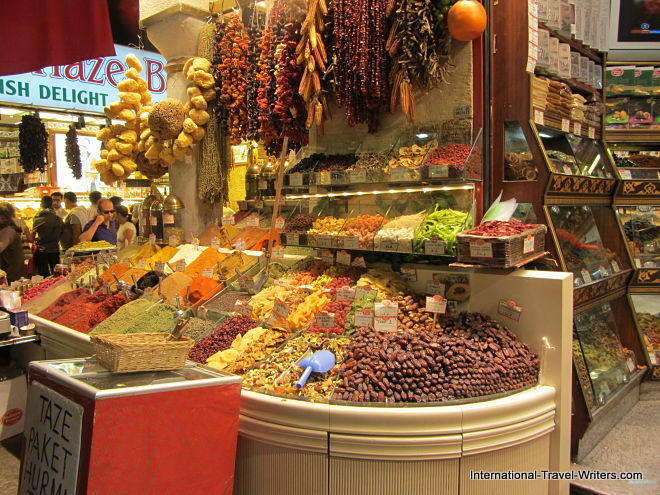 Spices, nuts, figs, honeycomb, olive oil, lotions etc. 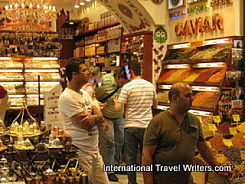 Most of the shops offer vaccum packaging so that it's easy to take souvenirs/spices home without a hassle with customs. 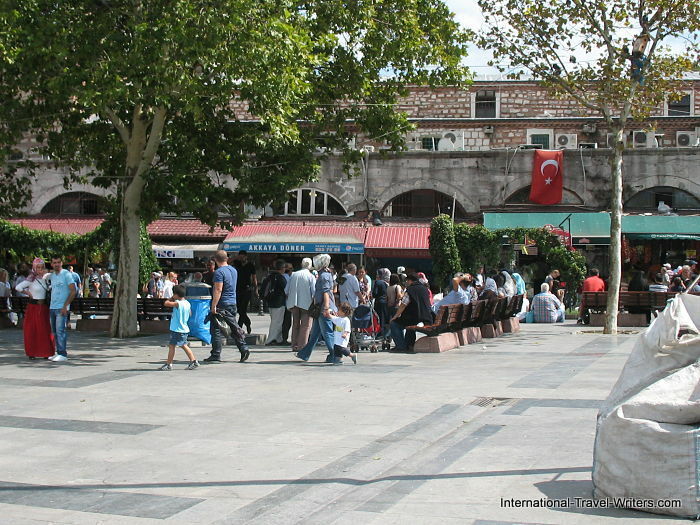 A maze of tiny shops surround the exterior of the Istanbul Spice Bazaar. 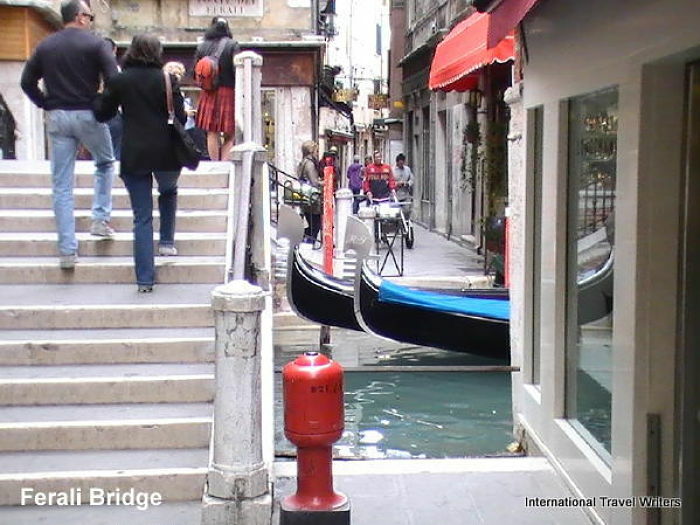 Flower shops selling plants and bulbs, fabric stores selling linens and yarn, pet shops selling even leeches and chickens, electrical shops selling light fixtures and switches, and the list goes on. 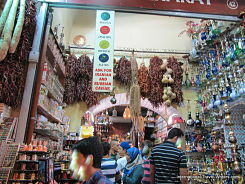 NOTE: A narrow street outside is Hasircilar Caddesi where spices and other goods are sold at a fraction of the cost inside the bazaar. 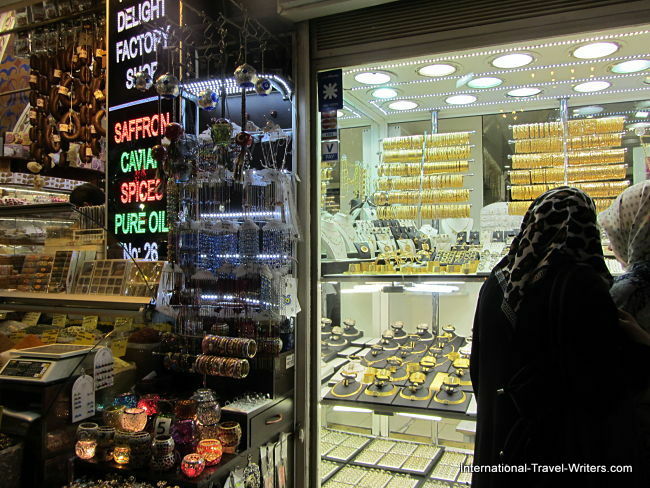 Jewelry shops selling gold bracelets and watches are sprinkled amidst the shops displaying their spices and oils. Pistachios and hazelnuts are among the native nuts and they are huge. They are offered in numerous shops. Almonds and pine nuts are plentiful also. But many of the nuts are shelled so try one first to taste the freshness before purchasing. Perhaps not unique to the Istanbul Spice Market but still rather intriguing is pestil which is dried fruit that is pounded into thin sheets (almost like beef jerky but thinner). You can buy it already plastic-wrapped or get a piece cut for you. It's also sold rolled up like a slim, fruit sausage. They have actual spicy sausage called sucuk and a fruit variation called cevizli sucuk...this fruit version is like a string of walnuts and fruit dipped in a jelly of thickened grape must that becomes a long stick of chewy fruit and crunchy nuts. We think of it as a fruit and nut kebab. 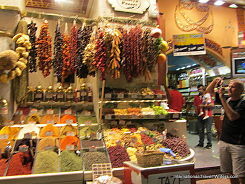 The Istanbul Spice Market has myriads of foodstuffs. 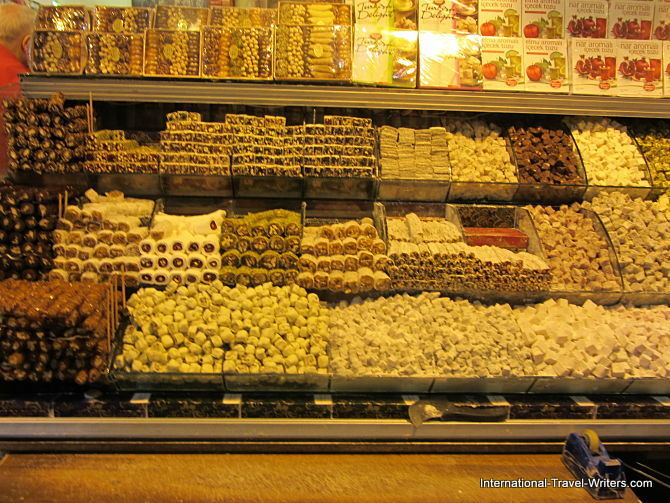 You can buy dried fruits, teas, nuts, and a sign saying "Turkish Delight" is spotted every few feet. 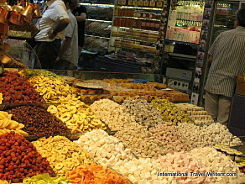 Dried fruits include papaya, guava, kiwi, pineapple, strawberry, apple, etc. Many weren't local but their variety added to the entire groupings. Rows upon rows of candies and other sweet confections. Oils and cheeses amongst the spice offerings. Many cheeses inside the bazaar are packaged but outside there are vendors who will slice off samples from huge blocks of cheese and you can try your preference...salty, stringy, crumbly, mild, etc. 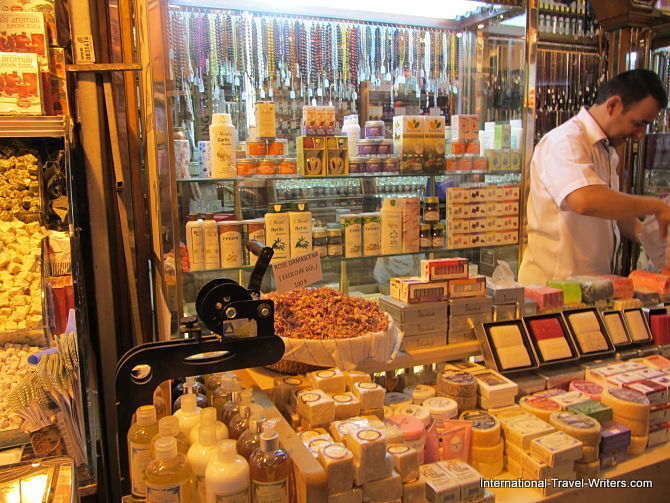 The shop owners are friendly and encourage you to try their products. I kept thinking...don't sneeze in here! 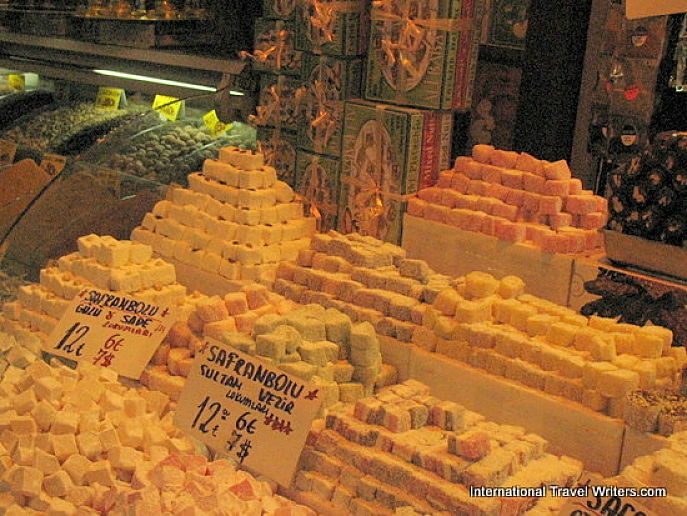 Turkish Delight (lokum) comes in slews of flavors starting with your basic sugar-dusted plain one and variants then lead to mint, lemon, chocolate, coconut coated etc. until you to pistachio and hazelnut studded. 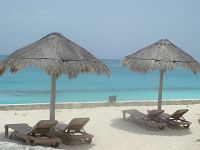 Most vendors encourage you to try their products. Do it. Some shops even specialize in Caviar while others have tea collections like dried hibiscus, jasmine flowers, dried rosebuds, vanilla, lemon, and the stand-by that everyone seemed to have...apple tea. 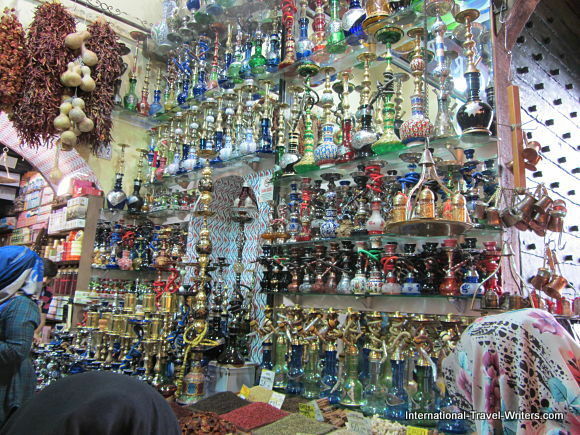 Huge assortments of Turkish pipes, hookahs and bongs line some walls. 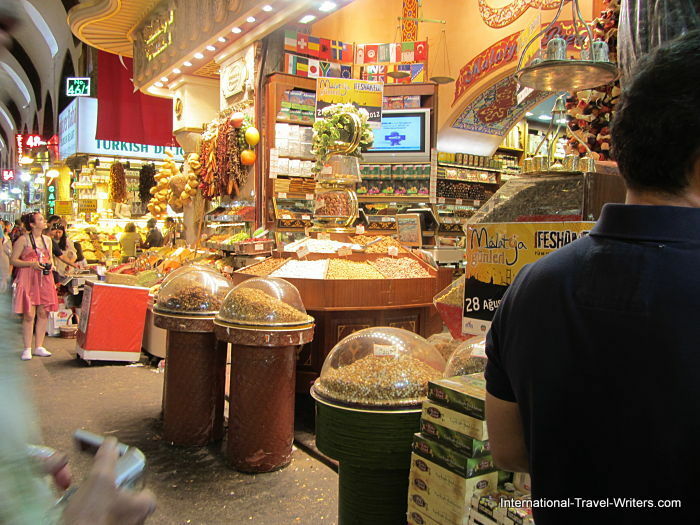 Shopping at the Istanbul Spice Bazaar is fun and you get a whiff of the exotic surrounds that are akin to other Middle East bazaars, though not as crazy as the Casbah in Morocco. I was thrilled to leave with a few grams of saffron that they placed in a sealed jar for me and did their "shrink-wrap"(so it could go through customs without problems). We are now huge fans of the bazaar.